^ Gazetteer of Planetary Nomenclature. [2006-12-06]. ^ The Eberswalde deltaic complex as a high science-return target (PDF). [2006-12-06]. 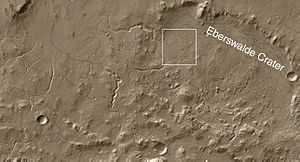 ^ 8 Years at Mars #6: Fossil Delta in Eberswalde Crater. [2006-12-06]. Schieber, J. Reinterpretation of the Martian Eberswalde delta in the light of new HiRISE images (PDF). Lunar and Planetary Sciences conference. 2007.